Super Smash Bros. Coming This Year for Switch | Nerd Much? Nintendo nailed us with the infamous “one more thing” at the conclusion of today’s Nintendo Direct. And while it was semi-expected, it was still a doozy. Super Smash Bros. has been announced for the Nintendo Switch. We then cut to another video of Splatoon’s male and female Inklings darting across a blank landscape as they fire ink at one another. The male vanishes into the distance as the landscape goes dark. The female is then halted by something behind her and she turns towards it. 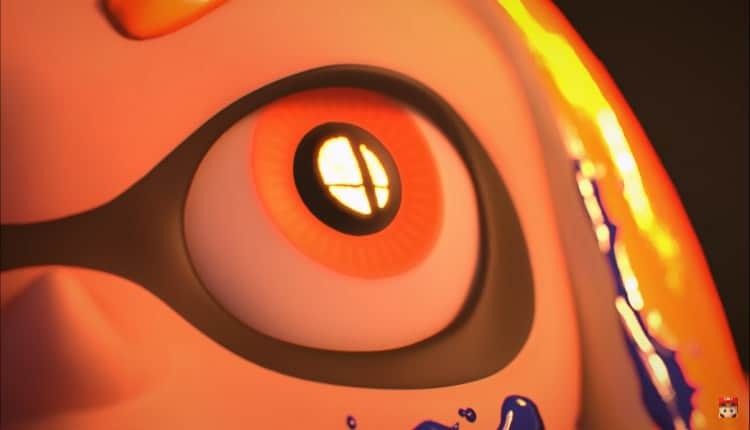 A look of surprise hits her as her eyes blaze with an image Nintendo fans are sure to recognize – the engulfed Super Smash Bros. logo. Shortly after, we catch a dark silhouette of Mario and what appears to be Breath of the Wild’s Link. Then, the Super Smash Bros. logo with a crowd of combatants in darkness standing below it. Super Smash Bros. 2018. And that’s all the details we’re getting. It certainly appears that the game is a brand new title for the Switch. Rumors have circulated for over a year that we would be getting an upgraded version of the Wii U entry in the series. Much like Mario Kart 8 Deluxe was an upgraded version of Mario Kart 8 on the Wii U. But that doesn’t appear to be the case here. Super Smash Bros. for Switch will surely be a focal point of Nintendo’s E3 presence. But if we’re lucky, maybe we’ll see a bit more of the game before a complete blow out hits us in June.